We know from our work with fishing communities around the world that often the best way to solve shared challenges is to connect groups of likeminded fisheries stakeholders to share experiences and solutions. Ahead of the event, the excitement was palpable on both sides. In the small town of Punta Gorda, Belize, word spread fast that the Cubans had arrived, and the Belizeans were eager to meet them. Although this was the first official exchange we’ve hosted between the Belize and Cuba, the two countries have enjoyed a long history of friendship and collaboration. One of the scientists in the Cuban delegation worked in Belize 14 years ago—when Belize was just beginning to accelerate its fisheries data collection, expand its marine reserves, and develop community based co-management processes. This time, he and the entire delegation had the opportunity to share the advances Cuba has made for lobster, conch, shrimp, and the recovery of the lane snapper fishery. Belizean fishermen were similarly excited to share their successful new “Managed Access” program. Both countries face the challenge of managing multi-species fisheries—which include dozens of species all living in the same habitat. The Cuban scientists explained their approach to first assess the vulnerability of 34 fish species and then prioritize the most vulnerable to monitor and recommend regulations. Together the delegations examined how these fish could be grouped into categories for management while data on each species improves. 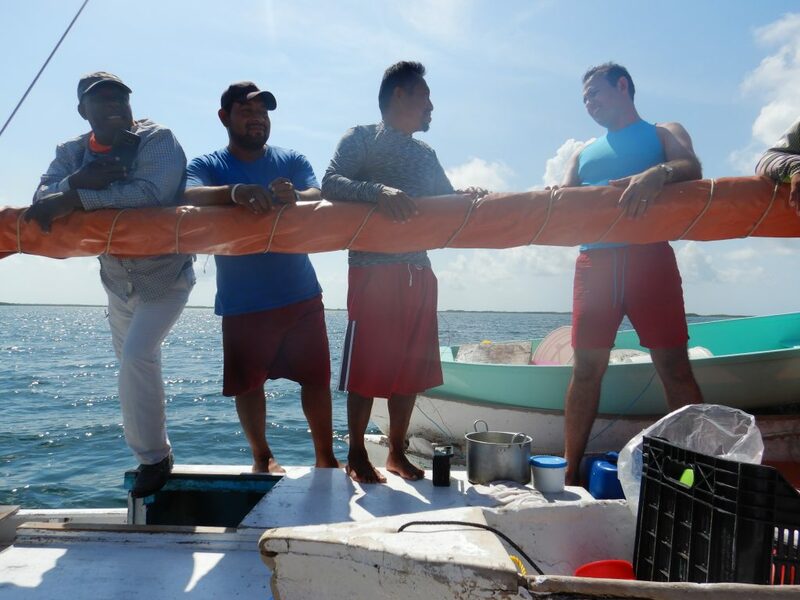 Local partners were eager to share their work and all the advances Belize has made to manage fisheries, conserve marine habitats, and ensure fishers and communities are involved and engaged—so we facilitated field trips on the water to see how sustainable fishing is done in Belize. Early in the exchange, we met a vessel fishing conch on the way to Turneffe Atoll for a real life demonstration of the new management system. The crew operates a sailboat, and then each fisherman uses individual canoes stacked on-board to dive for conch and collect their catch. 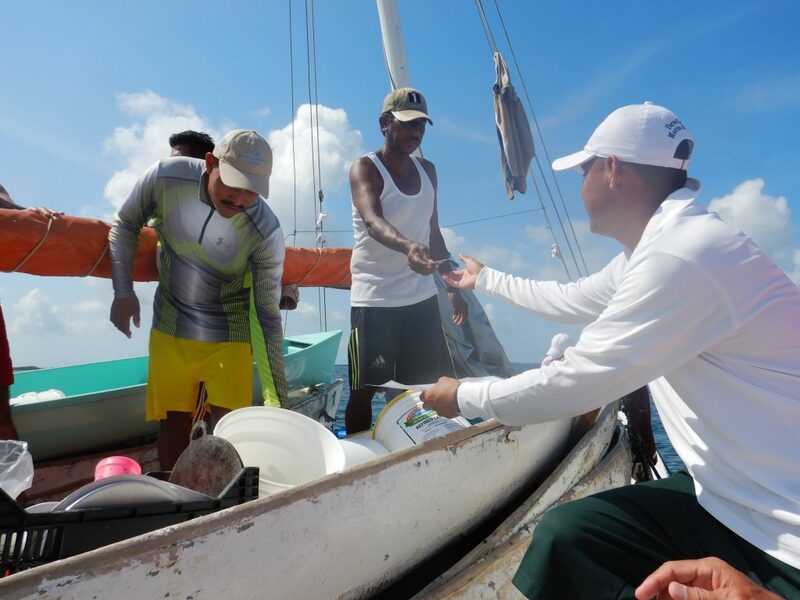 The local co-management organization, Turneffe Atoll Sustainability Association (TASA,) facilitated the meet-up and the Belizean fishers were eager to show the Cuban visitors how they fish and how seriously they take their management responsibilities. The Belizeans were especially excited to share their new sustainable fishing credentials. As part of the new catch requirements for licensing, they are required to share their catch data and fish within certain areas. They passed over their logbooks where they track their catch and their new licenses with their photos displayed. They proudly showed the group the orange and green stripes on their boat representing the fishing zones they have the right to access. Our partners from Cuba remarked on similar permitting and licensing systems and described a pilot program to grind conch shells into a powder used in chicken feed or building materials after the meat has been sold—finding ways to use the whole animal for less waste and greater profit. The Belizean fishers invited the Cuban delegates on-board and while people jumped back and forth to the sail boat everyone felt grateful for the opportunity – meeting people hard at work and still so willing to share and listen to friends from across the Caribbean Sea. Later in the exchange we headed to southern Belize and took a boat out to the Port Honduras Marine Reserve to meet the inspiring fishing leaders whose work supports local development and protects the reserve, and experience first-hand how governance of managed access zones, marine reserves and marine protected areas overlap and complement each other. We stopped at a research and enforcement station located on the tiny Abalone Caye where we were welcomed by rangers from the local organization, Toledo Institute for Development and Environment (TIDE). We knew this was a serious operation the second we hopped off the boat – uniformed coast guard officers stood at the edge of the island with their boat ready to take-off and the station was lined with buoys that are used to mark the boundaries of the reserve. TIDE staff pointed out on a map all the different zones in the reserve – areas that allow small-scale fishing with approved selective gear types, areas that protect coral formations and spawning aggregations where only tourism and recreational activities are allowed, and another area for preservation where only research is permitted. TIDE and the Belize Fisheries Department co-manage the reserve and the rangers explained how they work across agencies to enforce the regulations but prefer to provide education to prevent infractions. The rangers are there to help and often meet fishers on the water to answers questions about data collection and management; they rely on help from the fishers to notify them of unusual activity or unregistered boats in the area. A local fisherwoman told our group that she thinks the reserve and fisheries management is working, she sees that there are more fish now than before and more visitors too. The diverse partnerships we learned about in Belize showcased how working together improves science and compliance, involves and educates more stakeholders, creates opportunities for community development and leads to better managed fisheries and protected areas. We are now working with the delegations to identify where interests align for continued collaboration and where EDF can help achieve these shared objectives. Belize and Cuba are already leaders in the Caribbean because of their coral reef conservation and responsibly managed fisheries. We hope this exchange contributes to their friendship and benefits the marine ecosystems, coastal communities, and the interests of the Caribbean region. Uniting a range of stakeholders to work towards sustainable fisheries together is what made this exchange so successful. 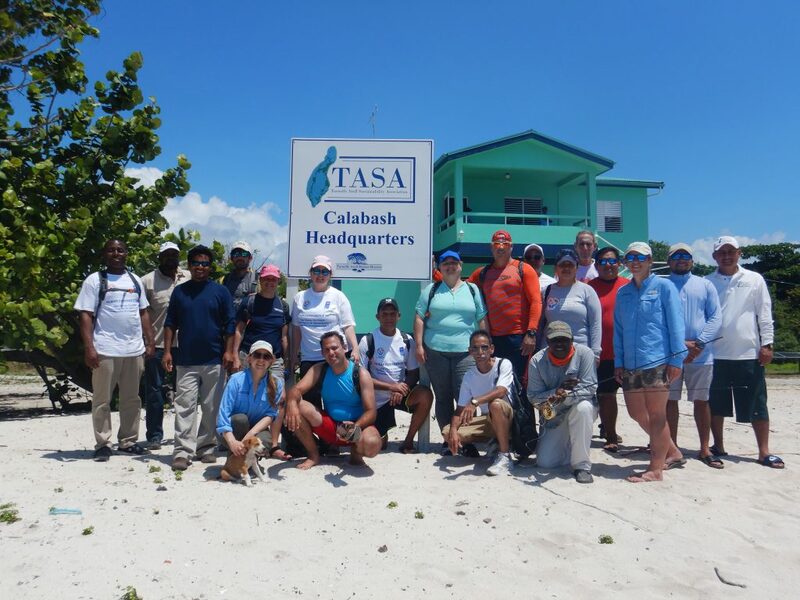 The delegation was hosted by the Belize Fisheries Department and local co-management NGOs (TASA and TIDE) as they visited many different sites across Belize. We also met with the National Fisherman’s Cooperative Producers Society, the University of Belize and fishers, researchers, and enforcement and conservation officers along the way. The exchange was formally recognized by both governments. The Cuban delegation was joined by the Cuban Ambassador and Consul to Belize, and was coordinated by fisheries administrators from the Ministry of the Food Industry and included experts in fisheries science, seafood quality, and conservation as well as a port director and two experienced boat captains. Haga clic aquí para leer este blog en español: ¿Qué tienen en común Cuba y Belice? ¡Mucho más de lo que parece! This entry was posted in Belize, Cuba, International and tagged collaboration, fisheries exchange, fishery exchange, learning, managed access, small scale fisheries, sustainable fisheries. Bookmark the permalink. Both comments and trackbacks are currently closed.